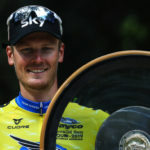 After a decade of dominance, the famous Team SKY racing name is about to be assigned to history, and the Jayco Herald Sun Tour will be one of the team’s last ‘hurrah’s’. 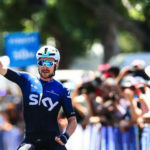 The boys in blue are looking to go out with a bang and steal some of the spotlight next week across regional Victoria, with their hunger for success anything but diminishing as Welsh classic specialist Luke Rowe explains. “Like every race, we will go in full on and are trying to be greedy, we want to wins stages, we want to have guys on the podium. A renowned toiler for his team, Rowe took his opportunity to claim a Jayco Herald Sun stage win in 2017 when he stormed into Beechworth a huge 33 seconds ahead of his nearest rival. 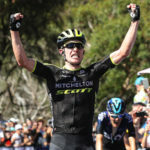 This year coming into the Jayco Herald Sun Tour, Rowe knows it will take a special effort to net a final win in Australia’s oldest stage race. 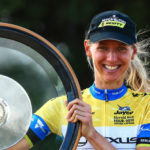 “Yeh, I think the two favorites are quite clear really – Richie Porte and Michael Woods and those two big teams respectively, they are riding at a great standard at the moment. “We will try to beat them with smart use of numbers and there is no doubt it is going to be hard on a climb as tough as that [Arthurs Seat]. “We have three riders who will give the GC a shake, really race it and give us numbers in the finals, with Dylan [Van Baarle], Pavel [Sivakov] and Kenny [Elissonde] and then we have our sprinter [Kristoffer] Halverson to really go for the sprints…every stage we will be going out there trying to get the most out of it. And now, with the finish line in sight it is a moment to reflect on how important a key sponsor is for success. “I think we have been very lucky to have had them [Sky] on board for the last 10 years and they have been very generous in their support. “Next year we will be racing with a different jersey, senior management at sky are looking for a new sponsor as we speak and hopefully they can pull that off – but we can only thank them really, they have invested a lot financially and in time as well and I think it has really taken the sport up a level or two. The Jayco Herald Sun Tour could give them a final send-off, so get roadside to cheer on cycling’s powerhouse team as well as all the other champions on wheels, racing down a street near you.